When ComfortDelGro cab driver Ng Chin Yiau knew a crash was imminent, he put his hand in front of his passenger to cushion the impact of her being thrown forward. The 32-year-old front-seat passenger, who gave her name only as Ms Lim, escaped unscathed, though she was visibly shaken. 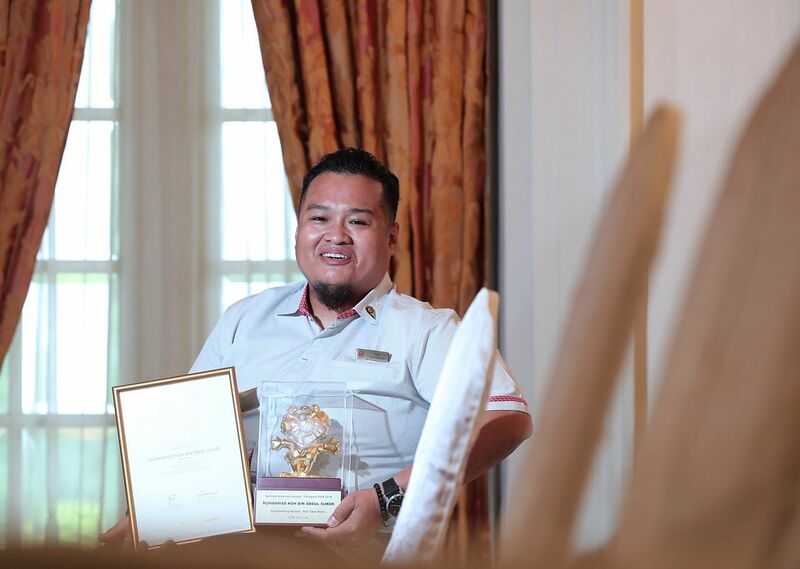 Yesterday, Mr Ng, 42, was one of 25 public transport workers who received the National Kindness Award-Transport Gold Outstanding Awards from President Halimah Yacob at the Istana. Recalling the incident which happened in July last year, Mr Ng said he was driving along Sembawang Road when a car suddenly veered into his lane. When he slowed down, a lorry hit his taxi in the back. Mr Ng later took the passenger to Khoo Teck Puat Hospital for a check-up and ferried her home. It was only later that he realised that the back of his left hand had been badly bruised. The injury healed after a week. "She has entrusted her life and safety to me. It is my responsibility to make sure that she is fine when an accident happens," said Mr Ng, a former salesman who has been driving taxis for about three years. In total, 445 transport workers from sectors such as bus, rail and taxi operations were commended for their acts of kindness on the job at the event held at the Istana. Into its 19th year, the annual Transport Gold awards is organised by the Land Transport Authority and Singapore Kindness Movement, and supported by public transport companies and associations. In total, 445 transport workers from sectors such as bus, rail and taxi operations were commended for their acts of kindness on the job. SMRT station managers S. Nadarajan, 53, and Muhammad Noh Abdul Sukor, 35, also received an Outstanding Award each. Mr Nadarajan, while working at Bras Basah MRT station in March this year, had helped an elderly commuter who had soiled himself. He helped him clean up and got him a new pair of trousers and sandals. "(The commuter) was initially very helpless and did not know what to do, but I was glad that he could move on and carry on with his day's tasks after that," said Mr Nadarajan. 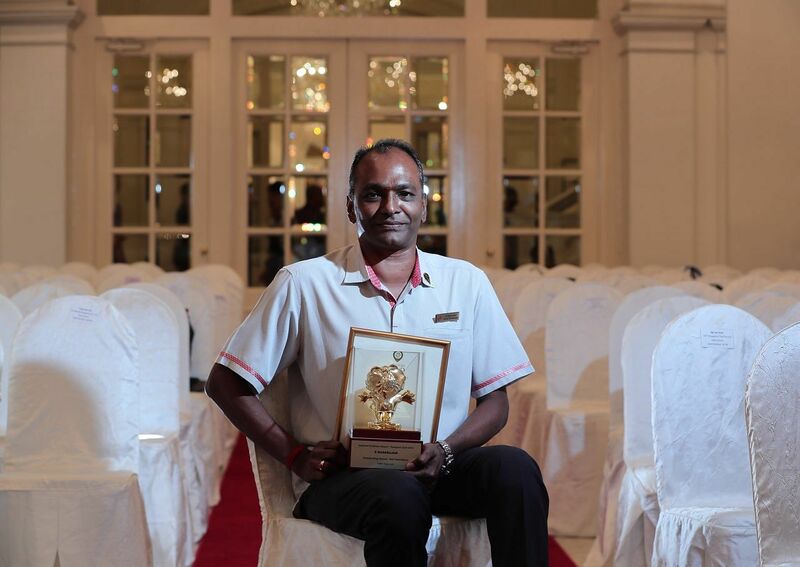 SMRT station manager S. Nadarajan was one of 25 public transport workers to receive the Outstanding Award at a Transport Gold awards event held at the Istana on Nov 1, 2018. Mr Muhammad Noh received a letter of appreciation from the Bedok South Neighbourhood Police Centre for how he handled an alleged molestation case earlier last year which happened at his workplace at Tanah Merah MRT station. Two men had pinned down the suspect, who had cut his forehead in the scuffle. Mr Muhammad Noh gave first aid to the suspect while standing guard to ensure he did not escape. SMRT station manager Muhammad Noh Abdul Sukor was one of 25 public transport workers to receive the Outstanding Award at a Transport Gold awards event held at the Istana on Nov 1, 2018. "Whether you are a suspect or not, we are all humans (and deserve to have our needs looked after)," he said.